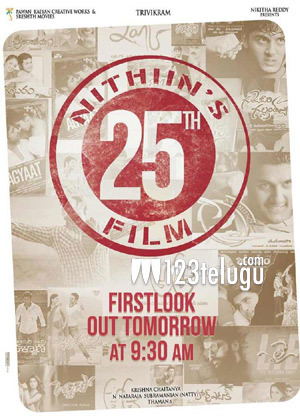 The first look of Nithiin’s upcoming film is going to be unveiled a day sooner than the original date. Few days ago, the actor had revealed that the first look will be out on February 12; however, in a surprise move, the team has decided to reveal it on February 11 at 9:30 am. Incidentally, it’s going to be Nithiin’s 25 film, and it has been jointly produced by Pawan Kalyan Creative Works and Shresth Movies banners. Trivikram has written the story, and Krishna Chaitanya has directed it. Buzz is that a song is going to be canned on Nithiin in Hyderabad from February 17 onwards. Thaman is scoring the music for this film, and sources close to the team have revealed that it’s going to be another superhit album of the year. The film is going to hit the screens on April 5.